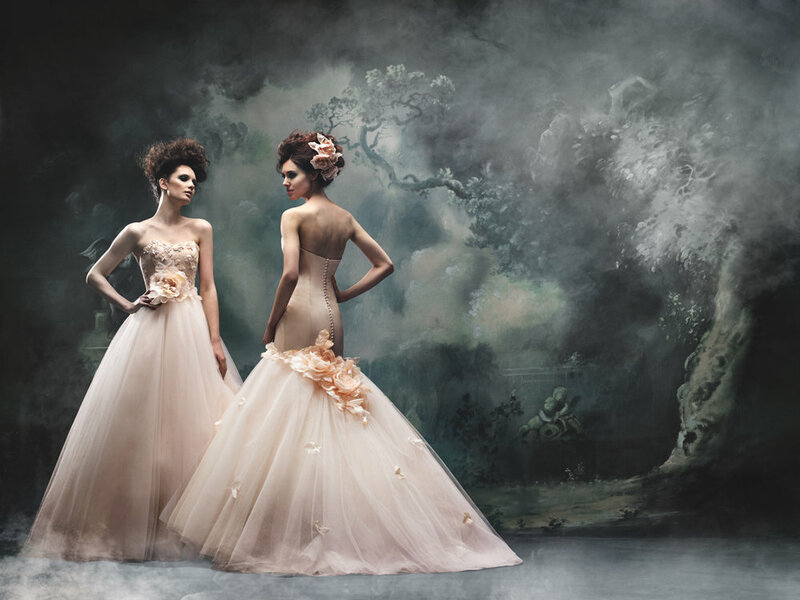 Anthophoros — The Couture Gallery - wedding dress boutique in Kensington, London. For her latest collection, designer Britta Kjerkegaard draws inspiration from the Garden of Eden, paying homage to the natural allure of the female silhouette and the innate beauty that nature holds. Seamlessly fusing graphic florals and botanical adornments with The Couture Gallery’s signature style of body sculpting corsetry, the Anthophoros collection echoes contemporary romanticism for the modern bride. Blush toned ostrich feathers adorned with 3D floral embellishments create a sense of drama whilst immaculately beaded laces illuminate with shimmering glamour. Floor sweeping silk crepe dresses capture the essence of effortless elegance, combining ease of movement with sophisticated glamour. Pale greens and misty blues offer the avant garde bride fascinating and non- conventional colour choices for her wedding day. Intricate headpieces featuring hand crafted silk roses compliment the floral adornments on the couture gowns, adding the perfect finishing touch to the entire look.